With a Brand Energy Analysis, your company will understand the essence of your brand and you will know how to make strong connections with your target audience. 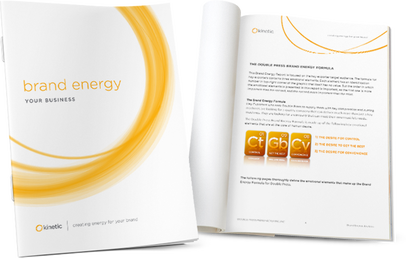 The Brand Energy Analysis puts the Brand Energy Formula into perspective and gives your company and team a clear path with actionable plans to make true connections with your core audience. Kinetic Branding developed a proprietary process for creating a Brand Energy Analysis that is not overwhelming and easy to implement. Most company leaders know that a marketing plan is something they need to write or pay someone to write, but the time and cost investment is overwhelming. Our Brand Energy Analysis is only 20-25 pages long, and focused on defining each Emotional Element, and presenting real ways to communicate felt needs in visual marketing pieces and one-on-one meetings. Once Kinetic discovers your top three Emotional Elements, it's important that you know the definition of each element in your formula and why it is so important for connecting with your audience. We explain each element, and highlight your Keystone Emotion, which is your pivotal felt need that should be present at all time. Each Emotional Element has a set of guidelines for creating unique and impactful visual identity solutions. What visual elements should be in a logo, website or brochure? What tagline or headline will trigger a response in consumers? These are the type of information that is vital in creating an emotive brand identity. Having well-branded print and digital collateral pieces like business cards, brochures and websites are very important, but what you say to people about your company and its products are equally important. It's imperative that your visual message accurately lines up with your personal conversations with the public.